Global equity markets continued to strengthen in March with the MSCI World index (in local currency) returning 1.6%, bringing the return for the quarter to 12.6%. Markets were buoyed by a dovish statement from the Fed, whose “patient” approach is unlikely to see any rate rises for some time. A “great” trade deal has been touted between the US and China, which has breathed further life into investment markets. Global growth displayed fresh signs of weakness in March, most notably in Europe where trade with China has declined. This prompted the European Central Bank to downgrade growth forecasts, sparking a fall in bond yields. Fourth quarter US GDP was revised downward on weaker consumer spending and non-residential investment. While the US economy is slowing, the preconditions for a recession are nowhere to be seen and the leading indicators are painting a picture of a muddle through growth scenario. Domestically, government bond yields fell to record lows as the RBNZ acknowledged the weaker global economic outlook and ensuing risks to the domestic economy. The decline in yields has been dramatic this year, with the ten-year bond yield falling by 0.6% to 1.75%. Key to the fall in rates was the RBNZ’s comment that “the more likely direction of the OCR is down”, leading to the market pricing in two OCR cuts in the next 12 months. Record low yields led investors towards higher dividend-paying stocks, a key feature of the New Zealand market. This created a further tailwind to the performance of our local market, which also benefitted from the improved global sentiment towards risk assets. 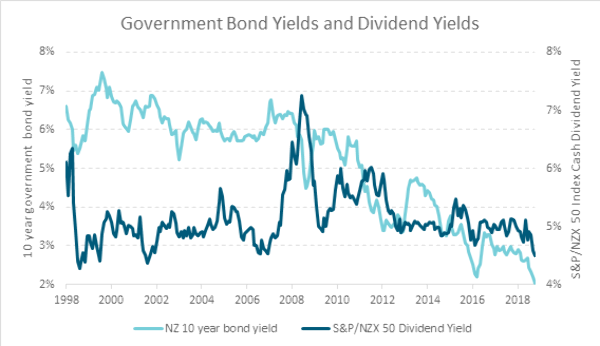 The appetite for yield has driven the dividend yield on the S&P/NZX50 Index to its lowest level since 2002. Trade deal negotiations deteriorate. This is not the base case as the murmurings from Washington and Beijing have been positive and investment markets have faith that a positive deal could potentially be achieved. But political agreements are often protracted and getting consensus agreement on a deal can be tough (just ask Theresa May). US earnings season disappoints. US Corporates will report earnings in a few weeks’ time. While earnings expectations are already pared back, we will be watching outlook statements closely to see whether the slowdown in the economy has translated into a reduction in corporate earnings and margins, both of which are at high levels. Interest rates rise. With domestic interest rates sitting at record lows and relatively aggressive interest rate cuts priced in, we have our eyes peeled on a range of leading indicators. Better-than-expected data could be bad news for equities, especially in the more defensive stocks which have had dividend yields driven down to record lows and PE ratios towards record highs. In New Zealand, monetary policy is already very accommodative and has been a factor behind the strong labour market and rising inflation. Core inflation is gradually rising, and firms look likely to face ongoing cost pressures, particularly for wages, where skills shortages and increases in the minimum wage are continuing. With our terms of trade at a healthy level and with the government planning to increase spending, the forward news flow will not all be unsettling. The financial markets are pretty close to treating rate cuts as a done deal, but we would not go further than the RBNZ’s line that “the more likely direction … is down.” In fact, at present, there is quite high uncertainty over whether the Reserve Bank will cut rates, and if so, what might be the timing. This makes positioning at the front of the yield curve quite challenging, given cuts are priced in already. At the long end of the yield curve, we have greater confidence that yields can rise over time, but given the near-term risk of further declines, we are holding back from an aggressive position. Credit markets are more reasonably-priced, unless we see a sharper decline in the economy. With government yields at such low levels, the yield pick-up from credit is increasingly appealing and we are lifting exposure across a range of issuers. Within equities, it is our view that defensive stocks may be supported by the near-term drive for yield. However, over the medium term we think that the equity market is looking stretched, particularly defensive stocks. Right now, we still view the market conditions more supportive for companies with long term corporate earnings growth. Disruptive technologies, demographics and the rise in consumer spending in Asia remain core medium term influences on markets. We will be watching for evidence of some stabilisation in growth, and we are most likely to reduce positioning further in defensive yield stocks over time if they continue to become more expensive. In multi-asset portfolios, we have removed our overweight position to equities, reflecting the more cautious outlook and increased valuation levels.